ANGLER a specialized provider of custom software development and IT outsourcing services, offers customized and on-time WPF/WCF services. Windows Communication Foundation is a part of the .NET Framework that provides a unified programming model for rapidly building service-oriented applications that communicate across the web and the enterprise. ANGLER Technologies, a specialized provider of custom software development and IT outsourcing services, offers customized and on-time WPF/WCF services. Solid experience in projects of different complexity and scope empowers us to adapt quickly to your requirements. With extensive experience in Microsoft technologies, we have a pool of expert developers who will deliver a very interactive and attractive user interface using Windows Foundation Presentation. We develop Windows Presentation Foundation applications using tools like Microsoft Visual Studio and Microsoft Visual Studio Express. With WPF, we create a very refined user experience on Windows. 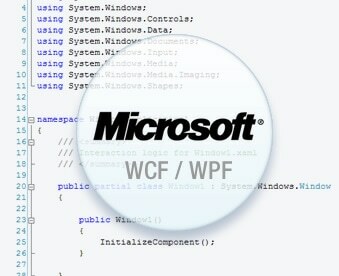 We also have proven our expertise in Microsoft Silverlight, a web-based subset of WPF. We understand the importance of GUI and so deliver very interactive and creative applications using Windows Presentation Foundation. We also customize WCF Services in SharePoint 2010 to offer most effective services to our clients. Contact us today to know more about our WCF / WPF application development services or to hire our WCF / WPF developers for your needs.